How do we determine the holding strength? S-5! has done thousands of load tests to determine the holding strength of our clamps and other brackets on many different roof panel profiles and substrates. We do that because the holding strength of any clamp or bracket varies widely depending upon the material and profile to which it is attached. There are hundreds of entries on our load tables (which also feed into the back end of our on-line snow guard system calculator). When this testing is done, whether for snow guard calculations or solar mounting attachments, it is in strict conformity to o ur load test protocols, copies of which are also available on our website. The testing is performed in a certified third-party laboratory by qualified lab technicians. 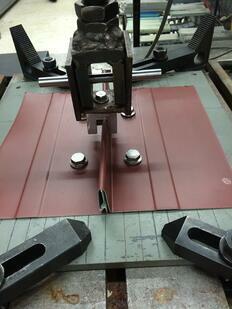 The-clamp to-panel seam connection is progressively loaded on a universal tensile test machine until it “fails”. Of course anything has a failure point, and these connections ultimately fail in different ways, or “modes of failure”. These modes of failure are also fully described within our test protocols and noted by a letter designation on the load test table that references back to the testing protocol. The purpose of the testing is to determine the load at which fastening failure occurs. The end game, of course-- is to match that tested load to the requirements of a specific project or application to be sure it is never reached when the system is loaded with snow (or any other force). We test a minimum of 3 specimens to the point of failure and then enter the average of those tests on our load table. That load is the “ultimate” load—the point at which failure occurs. Of course, no one wants to see failure occur when a system is in service on a roof project, so a “Factor of Safety” (FS) is employed to determine a safe “working load”. This is the common and accepted practice of the engineering community. When applying a factor of safety to the ultimate tested load result, it reduces the ultimate load to an “allowable load”. The question becomes, “what factor of safety” is appropriate? The S-5! 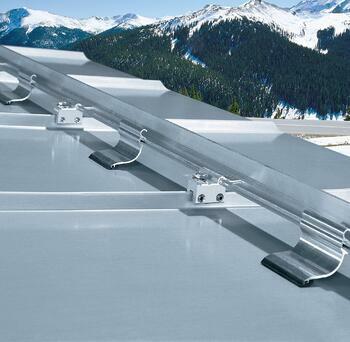 load test data defaults to a FS=2.0 when the load is parallel to the roof slope such as snow guard applications and FS=3.0 when the load is normal (perpendicular) to the roof in a negative (upward) load direction such as solar applications. This means for instance that the “ultimate load” will be divided by the Factor of Safety to arrive at the “allowable load”. These factors are editable by the user however, because we are not always aware of all the above-mentioned variables. For instance, the consequence of the failure of a snow guard system is somewhat different if the end use of the building is a cow shed on a farm as opposed to a downtown office structure on a busy street with pedestrian and vehicular traffic below the eaves. For this reason, the user of our load table (or calculator) is enabled to change the safety factor at their own discretion. We have seen users who have utilized safety factors as high as 10 and as low as 1.5. When you enter a FS below 2.0, a warning will appear advising that we don't recommend such a low FS, but ultimately the decision is up to the user. How to determine load values? Of course, the next step is to determine the loads that the system must be able to withstand when in service on any project. These change from job to job depending on the different variables involved-- roof size, slope and so on. Some projects may require multiple rows of snow guard assemblies to resist the sliding forces of snow. That’s why S-5! has a helpful snow calculator to assist with planning out your project. It will perform the engineered calculations necessary to convert vertical snow loads into the sliding forces needed to match to tested allowable loads taking into account the variables involved as well as the “Factor of Safety”. The calculator is easy to use, and even offers an option to get a certified engineer’s stamp on your calculations for a small fee. It will also do a bill of materials required for the project. Snow guards perform a structural function and like other structural applications Factors of Safety should always be employed on any project! Of course, without appropriate testing and quality assurances in production, it is all just guesswork.